This is a combination of my Mom and Dad's Jambalaya recipe with my friend Gary's quick tips to make it a little easier. It's got all the "Cajun" staples (a roux, the trinity, plus garlic and pepper) It's spicy and makes enough to feed a crowd. Making your own chicken stock for this recipe is cheaper and tastes better. Follow my link to find out how I make mine. If you don’t have a cast iron pot you can make a roux in a heavy bottomed pot instead. The trick is to stir constantly. You can NOT multi-task during this step. This is where the base of flavor for your gumbo comes. Be diligent, it takes about 20 minutes to make a roux the color you need. I use Bryan Cajun Smoke Sausage. The ½ C. of hot sauce might have you scared. Don’t be! 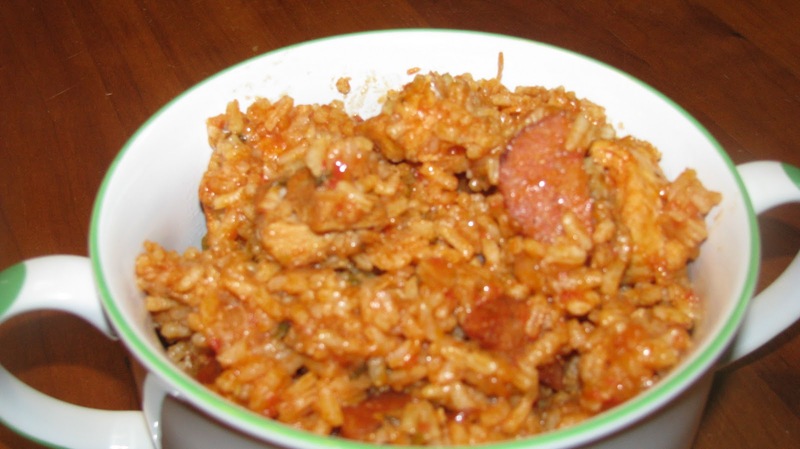 The sausage, chicken, and rice all absorb the hot sauce and give this jambalaya a great flavor. It is spicy, but not tongue numbing. I never knew Rotel had so many uses! Yeah, my Dad used to buy Rotel by the case. I buy it at Sam's for less than $1 a can. It comes in a pack of 10 but I use them fairly quick.